BrowseIgnite is a free software program which enables you to highlight text and share the highlighted text on social networking platforms such as Facebook and also use the selected words as search terms on Yahoo, Wikipedia, and other websites. BrowseIgnite is maintained by Game Honey and is very similar to HighliteApp, which is also maintained by Game Honey. BrowseIgnite adds no browser plug-in to your browsers but can provide you with third-party advertisements, which are not endorsed by the developers of the program. Due to the advertisements displayed, BrowseIgnite is categorized as adware, and we recommend that you remove it from the computer. BrowseIgnite is promoted on a modern-looking website and you may think that it is a reliable program. But it is worth paying more attention to this program before installing it on the PC. This ad-supported program works on every website and display third-party offers and coupons on almost every website, including Amazon, eBay, Walmart, and YouTube. BrowseIgnite is not associated with third-party websites, and the display of third-party advertisements should not be interpreted as the endorsement of those third-parties. Moreover, BrowseIgnite pop-ups and web banners may have nothing to do with the website that you are browsing. 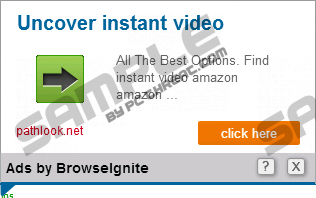 For example, when browsing Amazon or YouTube, a BrowseIgnite pop-up may redirect you to a dangerous website, there you may be deceived into downloading malware or filling your personal information in a questionnaire. If you have ever dealt with adware, you must know what adware programs use some tracking techniques to monitor computer users. Usually, adware records non-personally identifiable information. BrowseIgnite is no exception, and, soon after installing the program, some browser cookies may be send to your computer to record your impressions, search terms, clicks, browsing history, and other non-personally identifiable information. There is a possibility that some personally identifiable information will be recorded, too; but you can prevent this. Remove BrowseIgnite from the computer and make sure that the computer is properly protected against malware and spyware. Our team recommends that you use SpyHunter because this real-time security program can remove BrowseIgnite and fight off multiple threats. You will not have to worry about your online security; however, you should not forget that your operating system should also be kept up-to date. In case you prefer manual removal and want to try removing BrowseIgnite by yourself, use the following removal guide but do not forget to scan the system as soon as you uninstall the unwanted program. If you want to be sure that the computer contains no malicious files or programs, you should implement a reputable scanner once you finish the removal of the adware program. Quick & tested solution for BrowseIgnite removal.